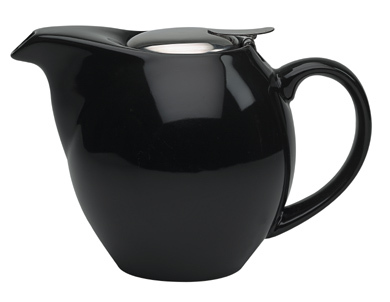 1 teapot (approximate capacity: 1100 ml or 37.4 fl oz; 6 1/4" h x 5 1/4" w x 8 3/4" l). Excellent! Wonderful price for large teapot. Use it daily! This teapot is a great everyday piece and I think anyone who orders it will love it, too. The design is good so it's easy to hold and pour from. It's so practical and pretty! You just can't beat it, especially with the sale price! This teapot is practical and perfect for daily use. It is a nice size, not too small or too large. The spout is very nice for pouring. The teapot washes and rinses easily. It is very attractive to look at and display. The company sent it very promptly with tea samples. Very good company. Will do business again! I purchased this to replace my broken Brown Betty and I absolutely love it. It makes 4 good sized cups of tea which is the perfect size for us. I really love that it never drips. It's just a great all purpose teapot. Love dealing with this company! Great service and the surprises they pack with my orders are always fun! Excellent, aesthetically pleasing, functional tea pot with surprising capacity. Would not hesitate to purchase another. This pot is not too small. I bought it to make tea for one. Love it so far. Cannot wait to try other teas. This is my second Zen teapot. I switched to these ceramic pots after using a cast iron tetsubin for a couple of years. The ceramic doesn't interfere with delicately flavored teas and doesn't require flame drying like the tetsubin does. The cute little Zen teapot brews 40 oz. (full to the top) and stays hot enough for an hour or so. Easy rinse and rack dry upside down. 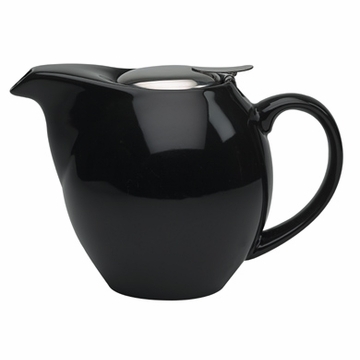 Opt for black to avoid unsightly tea staining. This is the second Zen teapot I've purchased from EnjoyingTea. The next time I need more tea, I might buy another as a gift. I bought it for my daughter (college student) and she loves it. The teapot is large enough for 3-4 cups of tea and lasts longer! Great purchase experience too. I will recommend to my friends and family! I love this tea pot - I use it all the time now! I was looking for a nice tea pot that I could use everyday. I did not want a small one and this one is the perfect size. It is also a fair price. I bought the Zen Teapot in white for myself & loved it so much that I bought the black one for my sister. I also got the matching cannister & tea warmer. She, of course, loves it! The shipping was very fast. All around an easy & happy transaction. Very good and stylish one!!! The teapot is worth 5 stars and an excellent rating. The strainer is inadequate for the task. To brew a full pot of tea as measured requires 11 grams of loose tea. When brewed the strainer is packed tight with the expanded tea leaves and hence much of the brewing is still in the leaves. My solution is to order a second teapot, let the leaves float loose and decant to the other teapot when brewed using the strainer as a strainer and not a brewing basket. We'd been looking all over for a simple, elegant teapot and this was it. Perfect. I was looking for a slightly larger tea pot than the one I was using. This fit the bill perfectly. The infuser basket is large enough to hold plenty of tea and it is so easy to clean. Pouring is easy and it never spills a drop. And how can you beat the price? Highly recommended. I am very happy with this teapot. Holds just the right amount of tea at the perfect temperature for my friend and I to enjoy!